During the school year of 1991-1992, when my oldest daughter was in third grade, I was still the leader of her Brownie Girl Scout troop (as I was from when she was in the second grade and would continue until the troop disbanded when they were in the eighth grade). 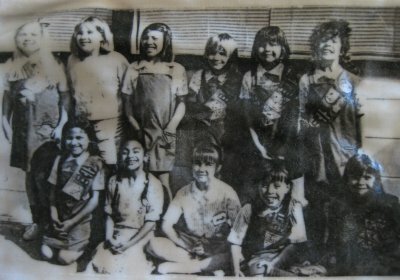 Third grade in Brownies (in the US) is one of the milestone years, as this is typically, the final year as a Brownie Girl Scout. The next level up is being a Junior Girl Scout (from grades 4-6). To prepare the girls for the transition from the primarily leader-led troop at the Brownie level to a more girl-involved troop at the Junior level, the troop can participate in a series of activities that introduce them to the next level of Girl Scouting. These activities include research into what a Junior Girl Scout wears, the types of activities she does and the kinds of badges she earns. The entire series of activities is called "Bridging" (i.e. they are bridging the distance from one level to the next). Bridging can be done only when a Girl Scout goes from one level to the next in Scouting and therefore had a very limited window of opportunity. In order to earn her Bridging patch, a Girl Scout must successfully complete the prescribed activities for her level. The third grade in Brownies is also traditionally the time when a Brownie Girl Scout "flies up" to become a Junior. The term "fly up" is a reference to US Girl Scout roots in early English Girl Guiding. In England, the leaders were called "Wise Owls" and the girls "flew up" from the lower level to the next higher one. In the US, a Brownie Girl Scout does not have to do anything to earn her Fly Up wings .. they are awarded to her simply because she was a Brownie in the third grade and that is the time she leaves that level. It's a wonderful way to carry on a lovely tradition and remember from whence our traditions came. During my daughter's third grade year, I knew these ceremonies were coming up and I knew that, typically speaking, I was going to lose a number of girls, as they became more interested in other activities. I wanted to make this year a memorable one in terms of not only the activities we did but for the final year end Court of Awards ceremony. So, in the planning of some of the activities the girls did, I made sure that they not only successfully completed the activites to earn their Try-Its (the badges that the Brownies earn) but that the finished product of some of those activies was actually going towards a memory quilt wall-hanging that I was going to make for each of the girls. Some of the activities included color "theory" and manipulation, art design and original "works of art". While usually such art activities would be done on paper, I had the girls do them on fabric squares. There were 13 girls in the troop; each of them made 13 squares of various designs, autographing each one. She then traded the other 12 squares with the rest of the troop. Everyone ended up 13 squares, but each square would have been made and signed by a different troop member. Since 13 is an awkward number to work with, I filled out the intended wall hanging by (1) making a center square of the Girl Scout trefoil with their troop number inside and autographed by the troop leaders and (2) taking a black-and-white troop photo and transfering it to fabric. The resultant wall-hanging is shown above. 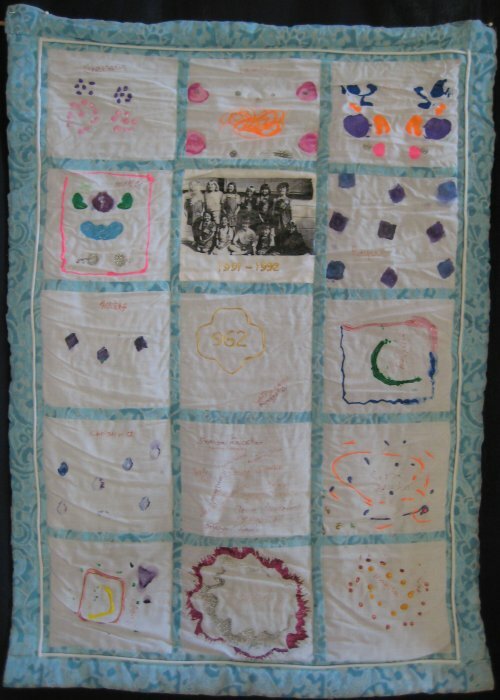 Each quilt was made with fabric supplied by the girls' Mom. Since I was making 13 of these quilts, I didn't want to get very sophisticated or fancy with them. They were joined with very simple sashing and the backing was folded to the front to make a self border. My one concession to having something "distinctive" on it, was the contract color piping around the perimeter. Somehow, I just could not make a plain quilt!! The quilting, of necessity, was a very simple stitch-in-the-ditch along the sashing seams. I was very pleased with the outcome. My daughter had it hanging in her bedroom for many years thereafter. When she was in the third grade, she was 9 years old. When she started Brownies in the first grade, I took my own Brownie uniform out of storage and asked her if she would like to wear it. Now, obviously, uniforms had changed dramatically over the intervening years and while I exceedingly pleased when she enthusiastically agreed to wear my uniform, I figured it wouldn't take her long before she realized that she was the only one in her troop with an "odd ball" uniform. Now, Girl Scout uniforms never become "unofficial". Once they are issued, they are always official, albeit they become "historic" once a new uniform comes on the scene. So, I knew that at some point, she would want a contemporary uniform so that she would look like the rest of her troop. I was also concerned about any teasing she might be the recipient of due to her different uniform. However, my daughter has always been, even at that age, a very self-reliant and self-confident person. In her mind, this wasn't a "different" or "odd-ball" uniform .. it was Mommy's uniform and she was very, very, very proud to wear it. Whenever she met someone new, the first thing she would say was "This is my Mommy's uniform and I get to wear it!" She was known to stop teachers in the hall at school and remind them of this fact. :-) In the first grade, I hemmed it up an incredible amount and through the three years that she wore my uniform, I just kept letting the hem down. 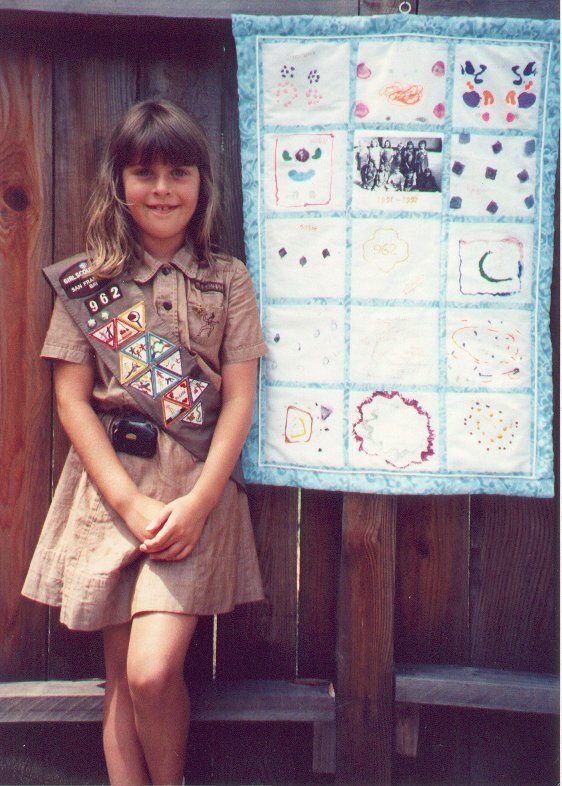 The one contemporary element of her uniform was the sash that she wore to identify her as a Brownie Girl Scout and to display the Try-Its that she had earned in her Brownie years. So, getting back to that mysterious arm in the above photograph, here is the full picture of the wall-hanging and of Catherine, wearing my Brownie uniform for the final time at the Court of Awards ceremony in 1992, where they had their Fly Up and Bridging ceremonies. As for Catherine's own uniform? I'm afraid we never did buy a contemprorary one for her ... she never wanted one.